Happy Earth Day everyone! As I mentioned in a previous post, "Don't Fear The Rain", days with light or sporadic rain and low wind in the spring should not be wasted. They are fabulous days for wildflower photography. Recently I headed to G.R. Thompson Wildlife Management Area in Linden, VA on just such a drizzly day. The fog or low misty clouds I had hoped for didn't materialize. The rampant underbrush and downed logs and branches throughout much of Thompson makes it very difficult to get a good wide composition that highlights the carpet of large-flowered trillium and I had hoped the fog would help provide some mood and hide/soften some of the distracting background. But I did get plenty of light rain, overcast diffuse light, and little wind. Here are some highlight images from the day with a few brief comments here and there on their making. Hope you enjoy! 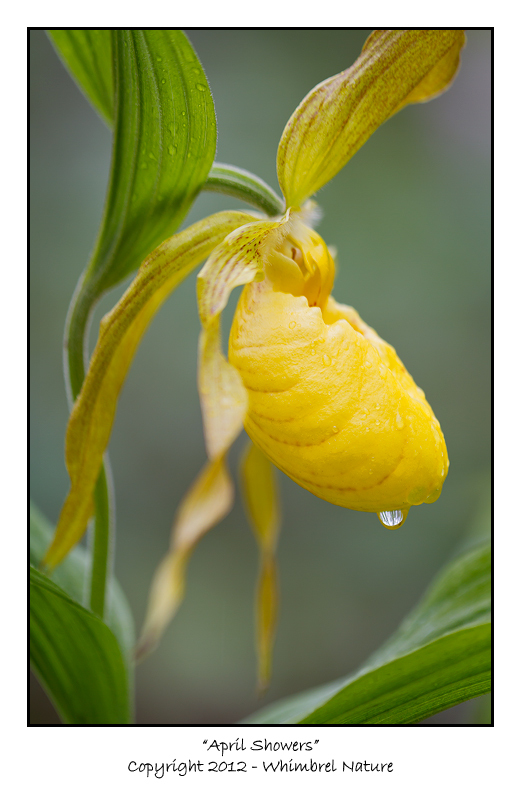 I couldn't resist the large raindrop hanging off of this newly emerged yellow lady's slipper (Cypripedium parviflorum) with its lens image of the bare forest tree line up above on the hill. I used a large aperture (f/3.5) to isolate the flower against an out-of-focus background of the hill/vegetation behind it. I also couldn't resist a cutesy title for this one. The well-known expression goes, "April showers bring May flowers" and in this case the shower is definitely in April and the flower doesn't usually show up until May in a normal year. So I thought it was an apt title, with a little tongue-in-cheek homage to the early spring, although I'm sure (as my wife also assured me) no one would have gotten it without my explanation. This large-flowered trillium (Trillium grandiflorum) was growing right next to the yellow lady's slippers and I almost passed it by and moved on. Luckily I took a second look and made some images, as it is probably one of the most perfect specimens I've encountered this year and I love the raindrops covering the upper petals and the forward facing leaf. 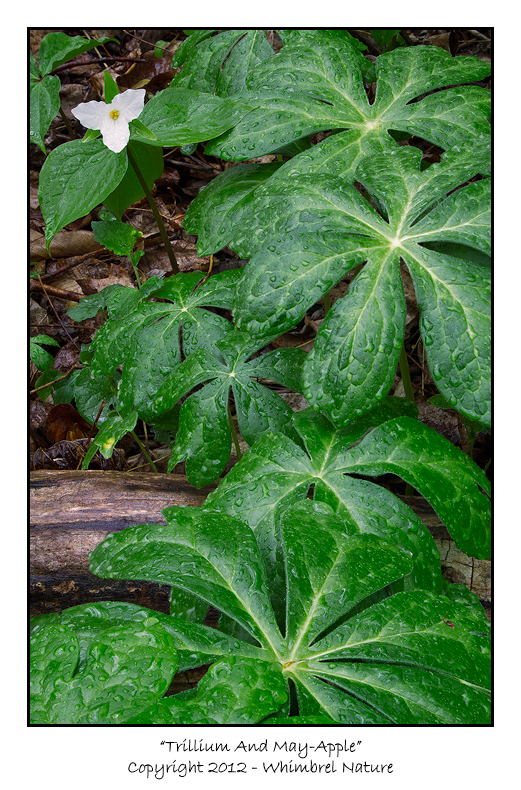 The May-apple (Podophylum peltatum) is abnormally large compared to the trillium this year. Normally the May-apple just starts to shade out the trillium as it is going by, but this year much of the trillium carpet is hidden under patches of May-apple. I decided to use this to my advantage by finding trillium flowers that were just poking out, surrounded by the lovely May-apple leaves. This is one of the best examples I found. 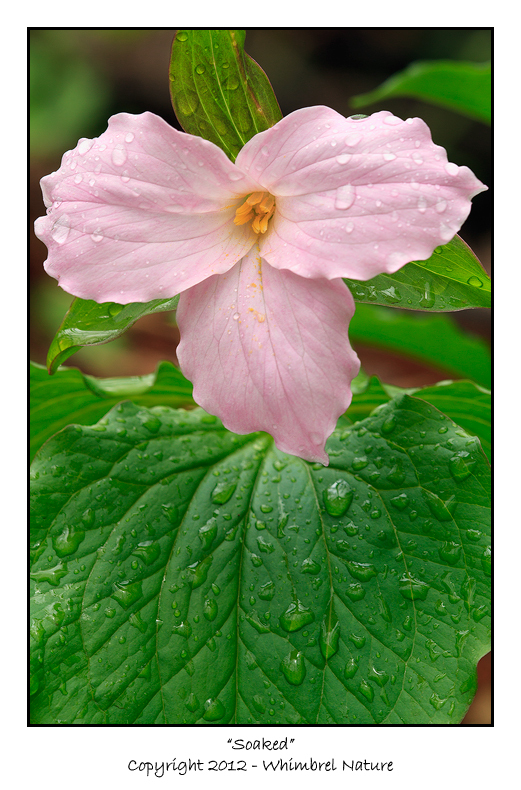 Note also the beautiful pink color of this trillium. 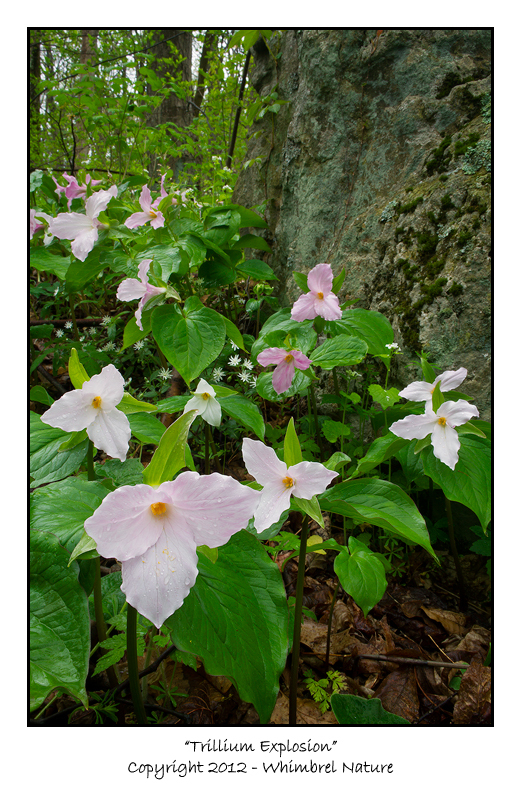 While it is true that large-flowered trillium turn pink as they age, the Blue Ridge and Shenandoah Mountains are also home to pink genetic varieties that are pink from first opening of the bloom to death (and there are seemingly many hybrids that are various gradations of the two). So it is not correct to say that this is an aging blossom; in fact it is quite fresh other than being beaten up by the rain a bit. This is one of my favorite areas at Thompson. 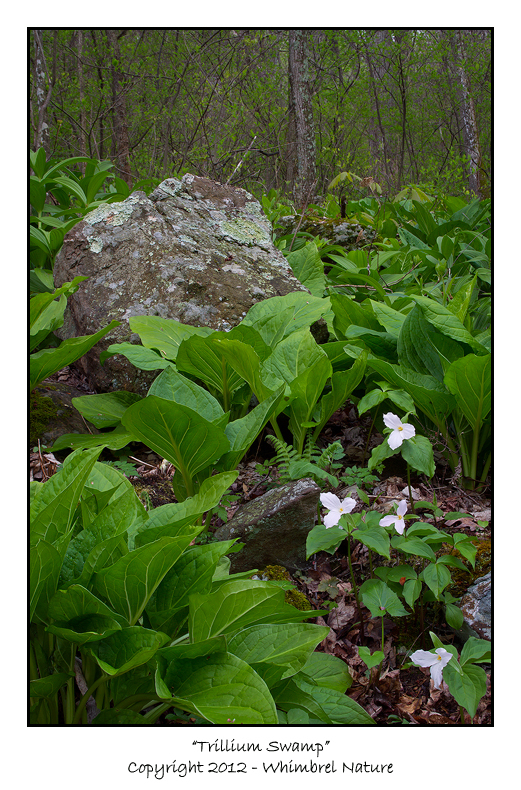 Just at the bottom of the "Trillium Trail" where the Appalachian Trail meets the fire road, there is a beautiful rocky swamp area full of skunk cabbage and false hellebore. Trillium grows all around and even throughout the swamp and just when you get to the swamp on the AT there are some lovely showy orchis specimens growing right along the trail. This is also a great area for birding. I could spend an entire day photographing in this one little area and never get bored or tired. Believe it or not, this is not a manufactured photograph. This is exactly how I found this trillium; growing up through the fronds of newly-emerged Christmas fern (Polystichum acrostichoides). 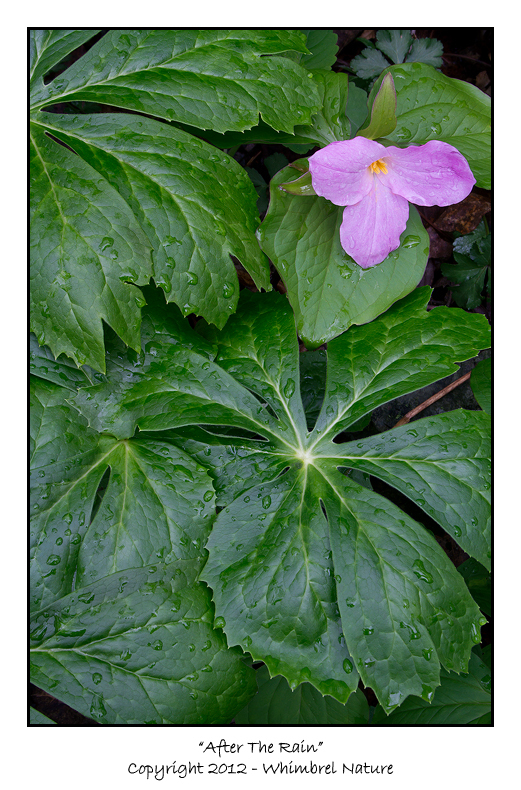 This final image was an earlier (and another favorite) image of a trillium flower and May-apple. In this case (and in the interest of full-disclosure) I used a new Photoshop technique (for me). I took two different images, one with the foreground in focus and another with the flower and background in focus. I was close enough and had to be angled enough to get the right angle on the trillium blossom that even with a small aperture, I couldn't get sharp depth-of-field from front to back in one photograph. So I took the two images and used the focus stacking feature in Photoshop CS5 to blend the sharp regions of the two images together into one image that was sharp from front to back. In retrospect, I wish I had one more image that was focused in the middle; and I did do that in a couple of similar series of images. But of course, the images that had the perfect composition and no wind movement in the flower, were the ones where for some reason I only took one with the flower focused and one with the foreground focused. Well, I'll get better, as I've a feeling this is a technique that I'm going to keep in my arsenal. The focus stacking procedure I used in Photoshop was quick, mostly automatic, easy, and I love the results. I love the dewiness present in all of this images, they evoke fond memories for me of the many days I spent back east walking through woods after a rain. 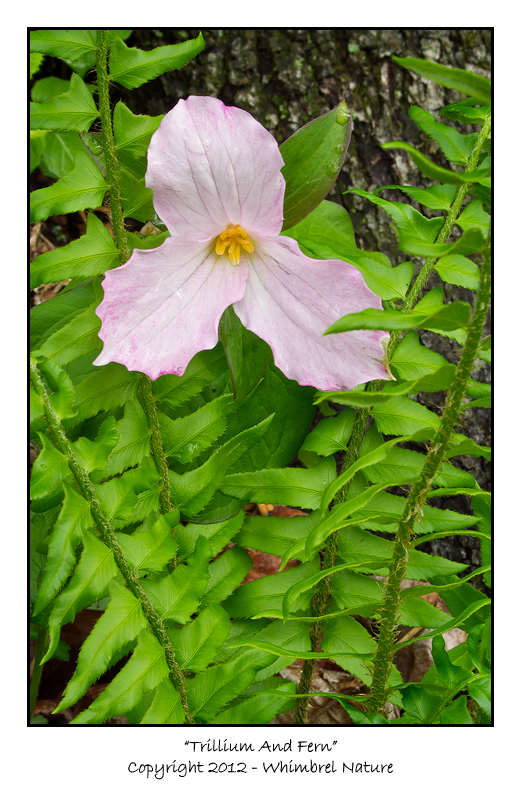 Beautiful Trillium images and that Lady's Slipper is just great!